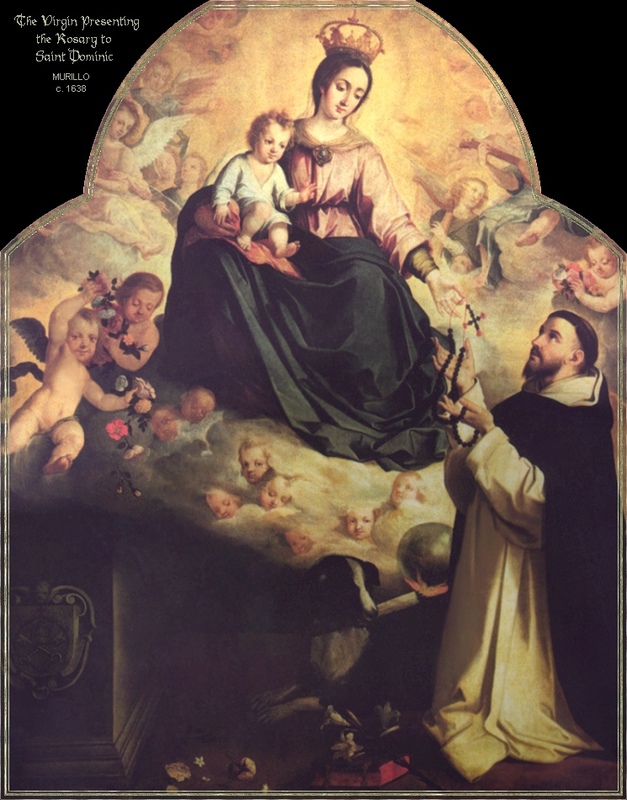 So here we are on October 7th, this Feast of Our Lady of the Holy Rosary. You didn’t think I’d escape posting something, right? If you’ve read this blog for a while you’ll probably recognize this picture of a well-worn (um, make that well-prayed rosary) which I had for many years before finally giving it away. It was a Rosary Army rosary, which meant it was destined to be given away, but I held onto it for many, many, many years before passing it along to someone whom I knew loved the prayer, the Blessed Mother, and her Son as much as I do. Timing, they say, is everything, and I was granted one last very important prayer on that rosary before passing it along to someone who would use it, even if it was only rarely, to think of me and my intentions. 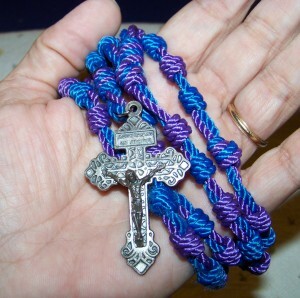 As it happens, I couldn’t have entrusted that rosary to a finer friend and prayer buddy. Which of course leads me to today’s prayer on a new rosary — made by the same beloved friend who made the blue and purple rosary above. The new one hasn’t been entirely broken in, and by that I mean, it’s still stiff in places where the twine doesn’t have much give. It’s getting comfortable in my hand, but there are many, many, many decades left on it, where I’ll worry the twine “beads” a little more, sweat a little more, maybe cry a little more, and forget it in my jeans and run it through another wash a time or three. And that’s ok. Because the rosary is meant to be used. It’s meant to be prayed, over and over again. And again. And again. I admit that I have sentimental attachments to some of these little sacramentals. I get comfortable with one or another for a number of reasons — whether I like the particular clink of one, or the feel of another, or like this black and gold one that has that Steelers pin on it. I know you noticed it. I’m not praying for the Steelers, ok? Really. It’s a sentimental reminder to pray for a deceased friend who maybe did pray for a Steelers win a time or two. I won’t judge him. But I do smile and pray for his soul. So whip out that rosary you have tucked away somewhere. It deserves to be used. Momma Mary deserves a little “phone call” today. Like the loving Momma that she is, she’ll quickly turn the conversation away from her, and to her Son. Please send me one you have made ,I could give it to someone in need, thanks and love to you.